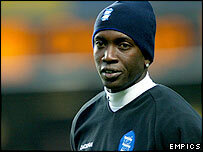 Birmingham have cancelled Dwight Yorke's contract by mutual consent just eight months after he joined the club. Yorke, 33, is expected to sign with Australian side Sydney FC in time for the start of their season in July. The Trinidad and Tobago striker joined the Blues from Blackburn for £250,000 in August but has fallen out of favour. "Both parties have agreed to terminate the contract so that Dwight can pursue a career in Australia," said a Birmingham statement on Monday. "The club would like to take this opportunity to thank Dwight for his contribution to our season and wish him the best of luck for the future."